NOAKHALI, Bangladesh, Mar 28 2012 (IPS) - Kalpana Rani Pal’s pottery business is modest by any yardstick but it is small enterprises like these that are helping reduce poverty levels in Bangladesh. 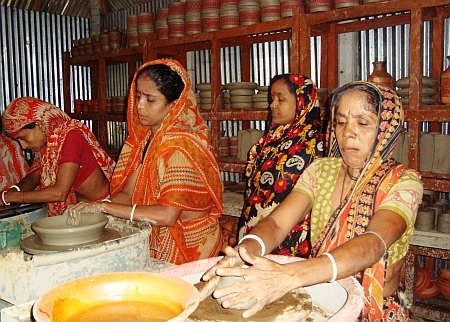 “I earn about Bangladeshi taka 6,000 (72 dollars) a month from selling the earthenware I make,” said Kalpana, 34, who is glad she enrolled for a three-month pottery-making course, run by the Noakhali Rural Development Society (NRDS), a non-government organisation (NGO). “The project is an effort to develop the skills of the local poor women who we find have potential in doing business,” Mohammad Kaiser Alam, programme coordinator at NRDS, told IPS. It helped immensely that the women had organised themselves into a samiti (women’s group) in the Dewanjee Bari village of Noakhali district, located some 320 km southeast of the Bangladeshi capital. Jhumur, who has just received a special order to supply 200 pieces of pottery items to a buyer from Dhaka, says the order will fetch her around 120 dollars as clear profit. “There was a time when we had no work opportunities in this district. Thanks to the free NRDS training programme we now stand on our own feet,” said Minati Rani Sutra, 34, a samiti leader currently busy hiring hands to cope with increasing orders for quality pottery. Some 30,000 women in over 1,200 samitis have benefited from skill development programmes run by NRDS in the district. Women are now being selected for further training as part of employment generation schemes. NRDS also helps with the marketing of cotton garments, jute carpets and quality products made from bamboo and terracotta that are sourced from the samitis. The ‘Millennium Development Goals (MDGs) Bangladesh Progress Report 2011’, released by the Bangladesh Planning Commission on Mar. 22, commends the country for reducing poverty by nearly half over the past decade. The MDGs are eight international development goals that all 193 United Nations member-states and at least 23 international organisations have agreed to achieve by the year 2015. At the top of the list is reduction in extreme poverty. “Economic growth has resulted in impressive poverty reduction from 56.6 percent in 1992 to 31.5 percent in 2010, the rate of reduction being faster in the present decade than the earlier one,” the report stated. “If this trend continues, Bangladesh could well achieve its MDG target of halving the population under the poverty line well before 2015,” the report adds. Debapriyo Bhattacharya, one of Bangladesh’s top economists and executive director of the Centre for Policy Dialogue, a reputed think-tank, told IPS that it is the work of NGOs that has been chiefly responsible for progress on the MDGs. Qazi Kholiquzzaman Ahmad, chairman of Palli Karma Shahayak Foundation, a key funding agency that facilitates NGOs in poverty alleviation programmes, said what made the difference was the focus on women. “Women’s empowerment has definitely contributed to poverty reduction. A significant number of women now work in medium to large enterprises and are also contributing to employment generation,” Ahmad said. Ahmad says that although the government has largely left the work of poverty reduction to NGOs, political commitment has been important in progress towards achieving the MDGs. Evidence of poverty reduction can be seen mainly in the villages where NGOs, over the decades, have mobilised resources in a way that the government alone could not have done. “Breaking the poverty cycle was not easy,” said Jalaluddin Ahmed, director of Trinamool, an NGO operating in the poverty-stricken northwestern Rajshahi district. “There was a time when women were not allowed to work. Going outside the home was restricted under strict purdah (religious bar on women) rules. So, poor families depended on only the earnings of the men,” Ahmed said. “Today, women decide how to earn and when to send their children to schools,” said Abdul Awal, executive director of NRDS. “It was not just about loans, but also skills development, advocacy, discussions among samiti members and, most importantly, a bottom-up approach,” Awal said. Bangladesh is classified as a least developed country by the U.N. for its low socioeconomic development indicators.